In late July 1916, the Australians fought their first action in the Battle of the Somme. At this point the British strategy focused on the seizure of the ridge east of Pozières village from where an attack could be mounted on German strongholds further north at Thiepval which had not fallen to British attack on the opening day of the battle, 1 July 1916. 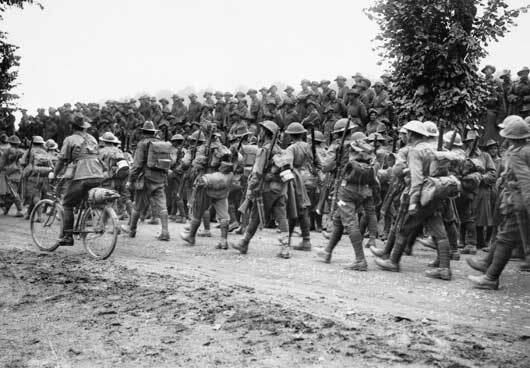 By the time the Australians entered the Somme battle the operation had become a series of attacks aimed not so much at a break-through of the German lines as the capture of key positions and the wearing down of the enemy. Between 23 July and 5 August 1916, the Australian 1st and 2nd Divisions captured Pozières village and Pozières heights, a ridge 500 metres east of the village. The initial attack began at 12.30 am on Sunday 23 July when the 1st Division seized the German front line and in the following hour reached the main road through Pozières. At dawn the Germans counter-attacked but the Australians held on. The rest of Pozières fell on the night of 23–24 July and further gains were made on the night of 24–25 July. 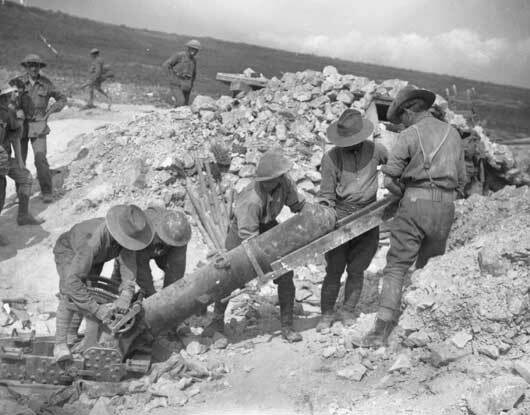 The Germans reacted to the seizure of Pozières by concentrating the bulk of their artillery on the Australians. Constant barrages were directed onto the village and the narrow approaches creating a nightmarish situation for troops forming up and attacking in the dark. By 27 July, the 2nd Division had taken over in Pozières. The 2nd Division was ordered to take Pozières heights. The attack commenced at 12.15 am on 29 July but the Germans were ready and the attack failed at a cost of 3,500 Australian casualties. 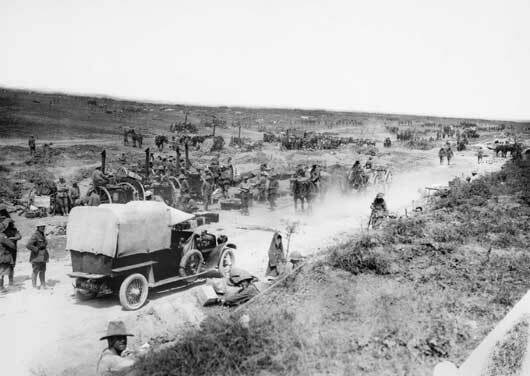 The Australian commander of the 2nd Division asked that his men might attack again rather than be withdrawn after failure. Following an intense bombardment on 4 August 1916, the Australian seized Pozières heights. The exhausted 2nd Division was now rested and the 4th Division took up positions on the Pozières Heights. Attacking north along the ridge, the Australians in ten days of continuous action reached Mouquet Farm. The 4th Division was now relieved. The farm resisted capture until 26 September 1916, the day after the commenced of a major British offensive. In less than seven weeks in the fighting at Pozières and Mouquet Farm three Australian divisions suffered 23,000 casualties. Of these, 6,800 men were killed or died of wounds. It was a loss comparable with the casualties sustained by the Australians over eight months at Gallipoli in 1915. 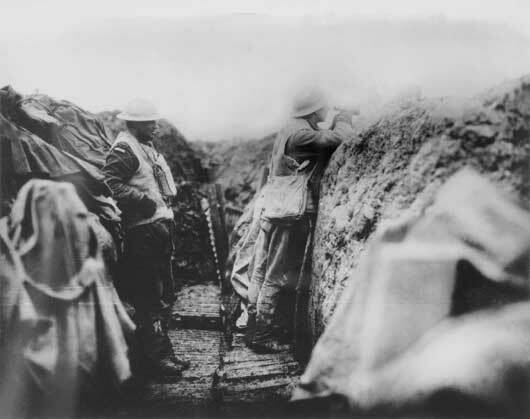 Two members of the 8th Battalion in Biscuit Trench, located in the front line east of Flers (AWM E00104). 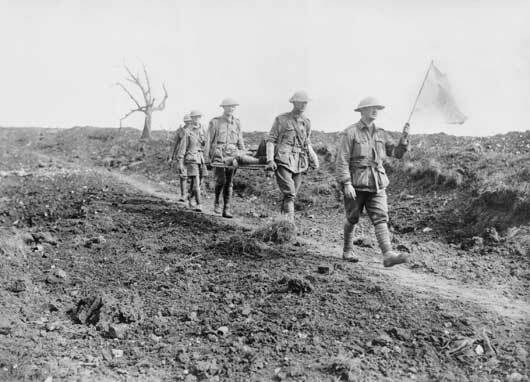 Stretcher bearers of the 6th Australian Infantry Brigade, under the Red Cross Flag, passing the old cemetery of Pozieres (AWM E04946). 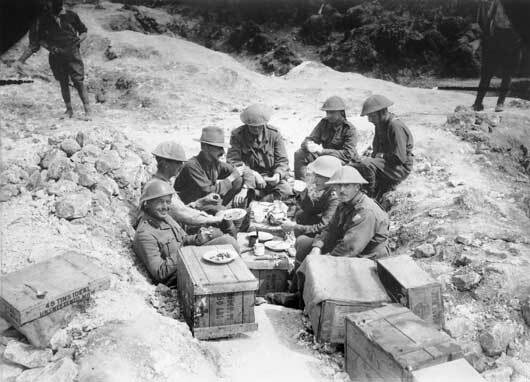 A group of Australian officers having breakfast in a shell hole in Sausage Valley in the forward area (AWM EZ0075). Infantrymen of the 6th Brigade, 2nd Australian Division, march back to their billets after a spell of duty in the front line trenches (AWM EZ0092). A busy scene in Sausage Valley during the fighting near Pozieres (AWM EZ0113). 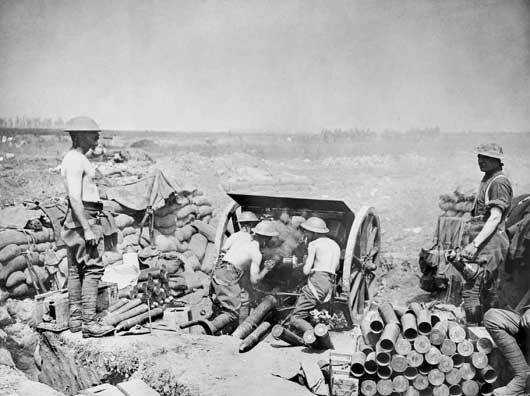 Members of an Australian trench mortar battery preparing to fire their heavy trench mortar in the Chalk Pit (AWM EZ0149).